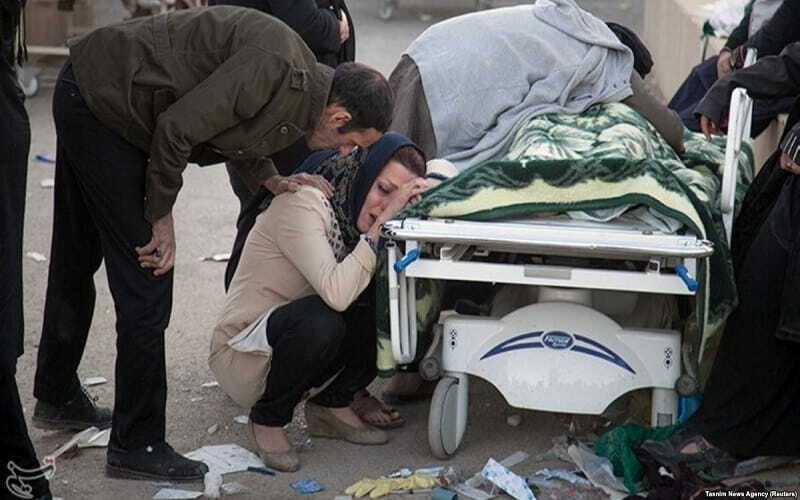 Only one year after Kermanshah earthquake, and while the people in different cities of the province are still living in tents or trailers, another quake shook the area. The 6.3 in magnitude earthquake shook vast parts of western Iran at 8 pm local time, on November 25. Initial estimates indicate that more than 700 were injured and at least 7 people were killed. Although precise data regarding the situation of those affected by the earthquake is not at hand, a brief look at the circumstances after last year’s earthquake speaks for itself. The inhabitants of the earthquake stricken areas have addressed their problems via the media times and again. The social activists setting up tweeter campaigns have disclosed the regime’s inaction throughout the last year. While the regime abuses the official media as a mean to cover up its inefficiencies, rubbing salt into the people’s wounds, the deprived people even sell their kidneys to provide their lives and to rebuild their homes. But the question is; how many more earthquakes should happen in order to secure the villages and cities in Iran against the quakes? How many more innocent people, including children, should be killed so that the national wealth would be used to rebuild and secure the earthquake-prone towns instead of fueling foreign conflicts? The main question is: When will this disarray, which is directly caused by the corruption in the urbanization system, end? Of course, this is only a small sample of the corruption that the regime is plunged in. This corrupt regime, not only hasn’t done much to help the people in the earthquake stricken areas but also has stopped the nationwide flow of aid to these areas. Ironically, the regime did the honorable people who rushed to aid our compatriots after the earthquake last year, including PMOI supporters from Kermanshah who rushed to help, answering the call of Mrs. Maryam Rajavi and the PMOI/MEK. On November 25, after the recent earthquake, Mrs. Maryam Rajavi sent a message of condolences to the afflicted people and called on all the youths and fellow countrymen and countrywomen to help the earthquake stricken people. The Iranian regime does not pay attention to the Iranian people, only thinking about fundamentalism and interference in other countries. How dare the regime to waste the Iranian worth to fuel foreign conflicts while the people in Kermanshah province are still passing the time under tents! the regime change in Iran is the only solution to end Iranians’ suffering.